Supporting schools one book at a time. Got questions? Click here to talk to our support team so we can help you with your read-a-thon! Share the power of reading for your next school fundraiser! It's FREE to set up and FREE to use so what are you waiting for? Please choose from the following options below or login to get started with your reading and fundraising challenge. Are you looking to create a custom read-a-thon for your next school fundraiser? If so, click the button below to learn more. Looking register as a teacher or a student to your school read-a-thon that is currently in progress on Read for My School? Need help? Check out our RFMS toolkit! Welcome to Read for My School! We are extremely excited that you stopped by to learn more about our read-a-thon solution, Read for My School. FREE to set up and FREE to use, Read for My School empowers all communities to create, customize, and promote a high impact, high-value reading and fundraising challenge that delivers results! We understand that school fundraising can sometimes be challenging and that promoting the right one takes time and good planning to get right! This includes finding a partner that can work with you to develop the right solution. With Read for My School, our goal is to provide that plan and it starts with us reaching out to make sure you have what you need to be successful. Our support team is here to answer any questions that you might have, but here’s some quick reasons why we believe RFMS is the perfect fundraising solution for you! Create your next community and school fundraising message around educational values - not selling products! Easily manage and promote your fundraiser with minimal volunteer resources across any mobile device – localized in both English and Spanish. Students earn achievement rewards based on goals you set and can share them instantly with friends and family through SMS, email, Facebook, or Twitter to drive pledge donation support. 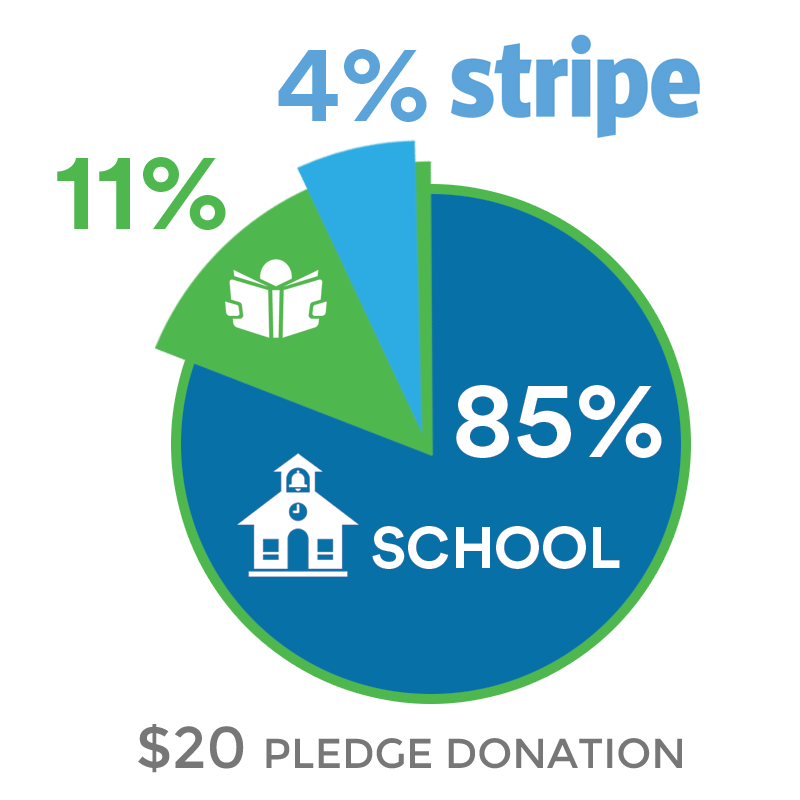 Earn more with your fundraiser with 85% on ALL online pledge donations coming back to your school. 100% on all offline check pledge donations. Never worry about credit card processing fees! RFMS handles ALL credit card processing fees per online pledge donation - 2.9% + $0.30 per online transaction. Earn cash back incentives – the more you fundraise, the more profits your school earns! Create your FREE fundraiser on Read for My School today and customize your fundraiser the way you want! It’s a NO RISK fundraising solution that only take a few minutes to get started. As you can see, we are passionate about what we do and hope to get a chance to help make your next school fundraiser the best it can be! Need materials to share to your PTA, PTO, or school board? We got your covered! So what are you waiting for? Let’s create your FREE read-a-thon fundraiser today! No risk. Less hassle. No hidden costs. When it comes to school fundraising, we provide you with the services you need to be successful! Creating a custom read-a-thon is always FREE providing you a no risk fundraising solution that is simple and fast to set up. A transparent business model with NO HIDDEN FEES focused on giving back to your school. * Service Fee includes all credit card processing charges (2.9% + $.30) associated with online transactions through our commerce partner, Stripe. Our support team provides FREE in-app support services to create a custom reading and fundraising challenge that works for you! So what are you waiting for? Let's get kids excited about reading and learning the importance of giving back! Our #1 goal is to provide quality customer care to make your fundraising experience on Read for My School the best it can be. Learn more about how our fundraising solution can work for your school. Sign up for our next webinar to learn more about our services. It's FREE to set up and only takes a few minutes to create your fundraiser. Connect, follow, and share us on social media. © 2019 Read for My School. Read for My School site and registered trademark logo ® are owned and operated by Pledgetree LLC. Sign up for our next webinar! Readformyschool.com ("Site," "us", “our” or "we") is owned and operated by Pledgetree LLC, P.O. Box 0451, Redmond, WA 98073. We can be reached by e-mail at info@readformyschool.com. Any other personal information you send to us or through the Site. We do not sell, trade, or rent Subscriber Personal Information to others. Personal information submitted to us through the Site will be used for the purposes specified in the policy or on the relevant pages of the Site. If you submit personal information for publication on our Site, we will publish and otherwise use that information in accordance with the license you grant to us. Your privacy settings can be used to limit the publication of your information on our Site and can be adjusted using privacy controls on the Site. Personal information that you publish on our Site or submit for publication on our website may be available, via the internet, around the world. We cannot prevent the use or misuse of such information by others. You expressly agree to the transfers of personal information described herein. This Section herein sets out our data retention policies and procedure, which are designed to help ensure that we comply with our legal obligations regarding the retention and deletion of personal information. personal data type will be deleted 120 business days after the completion of fundraiser on Site. All electronic financial transactions entered into through our Site will be protected by encryption technology. You are responsible for keeping the password you use for accessing our Site confidential; we will not ask you for your password (except when you log in to our Site). We will not send promotional emails to minors under the age of 13. For other users, you can "opt out" of receiving a promotional e-mail campaign by clicking unsubscribe at the bottom of the particular promotional email offer and following the instructions to complete the opt out process. Please note that even if you choose to opt out of a promotional e-mail campaign, we will continue to send you important service-related communications (e.g., lost password notifications) pertaining to the operation and participation in the Site. Blocking all cookies will have a negative impact upon the usability of many websites. If you block cookies, you will not be able to use all the features on our Site. MONITORING AND USE OF AGGREGATE PERSONAL INFORMATION Without disclosure of Personal Information about individual users, we may use, publicly disclose, and provide to third parties aggregate statistics about our users, their reading and fundraising activities, traffic patterns and other related Site analytical information. We may provide links to third-party web sites as a service to our users. Please be aware that we cannot control and are not responsible for the information collection, use and disclosure practices of such web sites. We encourage you to review and understand the privacy policies on these web sites before providing any information to them. For offline requests, please include your name, postal address, city, state, zip or postal code. We will not accept requests via telephone, email, or facsimile. If any provision of this Privacy Statement shall be adjudged unlawful or void or unenforceable in whole or in part, the remaining provisions shall continue in full force and effect. The Site is operated in the United States. By using this Site and/or providing us with your personal information, as far as legally possible, you waive any claims that may arise under the laws of other countries or territories located outside of the United States and you agree to submit to the exclusive jurisdiction of the courts of the Washington State. We may revise this Statement at any time by updating this posting without advance notice to you. Such revisions shall be effective immediately upon posting. Therefore, we encourage you to visit our website to review this Privacy Statement from time to time. Welcome to an innovative approach to school fundraising. Our vision is focused on promoting community values, not selling products! Welcome to Pledgetree! We’re creating a network of peer-to-peer digital fundraising solutions that empowers you to connect education-based community values with charitable giving. While there are many online and offline fundraising solutions to choose from, our vision focuses on providing you the tools and services to create custom fundraising opportunities that strengthens your community outreach message to what is taught in school or at home, not sold. Our focus comes from the fundraising story you want to express to your supporters! Everything we produce at Pledgetree revolves around a simple philosophy of creating the right tools for you to tell the right story for your community fundraising needs. Promoting the right storytelling experience is the epicenter of a successful fundraiser as it connects and binds our cause-marketing message to community support. Whether it’s building products to support childhood literacy, physical fitness, or the creative arts, we are dedicated to designing digital fundraising solution that evangelizes a deeper community message and lasting legacy with your supporters. Our commitment is providing you with solutions that are constantly evolving in an ever-changing digital world. We now live in a digitally-connected society where the average person spends 4.7 hours with a mobile device in their hand. While digital media has transformed how information is consumed, it has also remapped how supporters will connect to your fundraising outreach strategy. The days of take home flyers are being replaced with digital fundraising solutions that provide instant access to supporters on the go. Whether through social media, email, or SMS chat, we provide your community fundraiser with a social gateway to extend customer reach as well as donation potential. All Pledgetree products are designed mobile-first with a single goal of making sure that everyone can connect to your digital fundraiser at anytime, anywhere, across any mobile device. This focus provides you a digital approach to fundraising that maximizes participation – no matter how your community or organization embraces technology. Our team is passionate about making your fundraising experience the best it can be! With over 25+ years in education and entertainment software, Pledgetree provides you with a team of passionate professionals that understand the importance of developing the right products for the right market. We are consistently looking to innovate while providing your community with safe and secure digital fundraising solutions that you can trust. We are customer-focused, customer-ready, and looking at expanding our product suite across community topics that deliver on that trust to provide high impact, high value fundraising solutions. We are a small, but growing team looking to build on the foundation we have in place to provide all communities with a fundraising approach that delivers the results you need! A successful fundraiser is all about teamwork and it starts at building solutions that communities care to embrace and feel good about supporting. Read for My School (“RFMS”) is a SaaS (“Service”) fundraising solution that empowers customers to create, manage, and market digital read-a-thons. Pledgetree, LLC (“Pledgetree”) is a for-profit organization registered under the laws of the State of Washington in the United States whose registered office is at P.O. Box 0451, Redmond, WA. 98072. **TERMS** Pledgetree charges a flat Service percentage fee on all payments collected on the RFMS Site. The Service fee covers all RFMS Services on the Site including Stripe Connect payment processing fees (2.9% + 0.30) per online transaction collected through the RFMS Site. **USE OF MATERIALS** Unless otherwise indicated, all content appearing on this Site is the property of Pledgetree, their respective parent(s), subsidiaries and/or affiliates available herein, and is protected, without limitation, by US, UK and other copyright and trademark laws. The information and materials, including text, images, audio, video, computer source code and software, appearing on this Site are presented for your participation in RFMS only. Copying these materials for anything other than your participation in RFMS is a violation of copyright and trademark laws. You may not reproduce, duplicate, distribute or modify in any way any materials available on this Site without written permission from Pledgetree, and misuse of names, content, or of any of the information appearing on this Site may violate copyright and trademark law. If you access this material outside the US or UK, you are responsible for compliance with local laws. **LIMITATION OF LIABILITY** PLEDGETREE AND ITS SERVICE PROVIDERS ASSISTING WITH THE SITE, AND THEIR RESPECTIVE OFFICERS, DIRECTORS, EMPLOYEES, AGENTS, PARENTS, SUBSIDIARIES, SERVICE PROVIDERS AND AFFILIATES (INDIVIDUALLY AND COLLECTIVELY “PLEDGETREE AND AFFILIATES”): (1) WILL NOT BE HELD LIABLE, UNDER ANY CIRCUMSTANCE, FOR YOUR USE OF THE SITE, SITE SERVICES, SITE CODE, AND/OR SITE CONTENT, WHETHER ACCESSED VIA COMPUTER, SMART PHONE, TABLET, OR OTHER DEVICE AND MAKE NO REPRESENTATIONS OR WARRANTIES, EXPRESS OR IMPLIED, ABOUT THE INFORMATION AND MATERIALS APPEARING ON THIS SITE, WHICH IS PROVIDED "AS IS;" (2) TO THE FULL EXTENT ALLOWED BY LAW, DISCLAIM ALL WARRANTIES, EXPRESS OR IMPLIED, INCLUDING WITHOUT LIMITATION THE IMPLIED WARRANTIES OF MERCHANTABILITY AND FITNESS FOR A PARTICULAR PURPOSE; (3) DO NOT MAKE ANY REPRESENTATIONS THAT THIS SITE, SITE SERVICES OR ITS CONTENTS WILL BE ERROR FREE OR THAT DEFECTS WILL BE CORRECTED. UNDER NO CIRCUMSTANCES, INCLUDING NEGLIGENCE, SHALL PLEDGETREE AND AFFILIATES BE HELD LIABLE FOR ANY DIRECT, INDIRECT, INCIDENTAL SPECIAL OR CONSEQUENTIAL DAMAGES AND EXPENSES WHATSOEVER ARISING OUT OF OR IN CONNECTION WITH THE USE OF THIS SITE, SITE SERVICES, SITE CODE, AND/OR SITE CONTENT, OR FOR ANY MATERIALS CONTAINED HEREIN, WHETHER ACCESSED VIA COMPUTER, SMART PHONE, TABLET, OR OTHER DEVICE EVEN IF ADVISED OF THE POSSIBILITY OF SUCH DAMAGES. YOU UNDERSTAND AND AGREE THAT YOUR USE OF THE SITE AND SITE SERVICES IS PREDICATED UPON YOUR WAIVER OF ANY RIGHT TO SUE PLEDGETREE AND AFFILIIATES DIRECTLY OR TO PARTICIPATE IN A CLASS ACTION SUIT FOR ANY LOSSES OR DAMAGES RESULTING FROM YOUR USE OF THE SITE. CERTAIN STATE LAWS DO NOT ALLOW LIMITATIONS ON IMPLIED WARRANTIES OR THE EXCLUSION OR LIMITATION OF CERTAIN DAMAGES. IF THESE LAWS APPLY TO YOU, SOME OR ALL OF THE ABOVE DISCLAIMERS, EXCLUSIONS, OR LIMITATIONS MAY NOT APPLY TO YOU, AND YOU MIGHT HAVE ADDITIONAL RIGHTS. **UNSOLICITED MANUSCRIPTS** Pledgetree does not accept the submission of unsolicited manuscripts via this Site and does not accept responsibility for any such submissions. **GOVERNED BY UNITED STATES AND WASHINGTON LAW; JURISDICTION** This Site is operated in the United States and is designed for and targeted for school fundraising in the United States and United Kingdom. It is governed by and operated in accordance with the laws of the United States or the State of Washington as applicable, without giving effect to their principles of conflicts of law. By using this Site and/or providing us with your personal information, as far as legally possible, you waive any claims that may arise under the laws of other countries or territories located outside of the United States or states other than Washington, and you agree to submit to the exclusive jurisdiction of the courts of the State of Washington and the federal courts of King County, located in Seattle, WA. **COPYRIGHT INFRINGEMENT** Pledgetree prohibits the posting of any information or materials that violates or infringes the copyrights of any person or entity. If you believe that your work has been copied and made available on this Site in a manner that would constitute copyright infringement, please send all relevant details in writing to our designated Copyright Agent. Upon receipt of such notification, Pledgetree will remove any posted submission found to be infringing the rights of any person or entity in conformance with 17 U.S.C. §512(c)(3). United States law provides strict penalties for submitting false claims of infringement. **TERMINATION** In appropriate cases, Pledgetree will terminate subscriptions or accounts of repeat copyright infringers. If you believe that a user of this Site is a repeat infringer, please contact Pledgetree's Copyright Agent as described above and provide enough information for us to verify the individual is a repeat infringer.